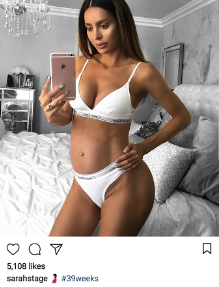 Six pack model Sarah Stage, who gained popularity by showing off her small tummy while she was pregnant has given birth to her second son, named Logan. She had said she had 1 more week before she'd welcome her next patter of feet, but the newborn decided to be born on Monday, Oct. 16, 2017. "We are so overjoyed and happy to welcome baby Logan into our family." The couple announced that their new son, Logan weighed in at 7 pounds and 2 ounces and measures 19 inches long. They have an older son, James Hunter, who is 2 and 1/2 years old.